These majestic craggy cliffs just south of Galway collectively form one of the most stunning panoramas in all of Ireland. Walking paths and viewing platforms line the edge for over a third of a mile, while the sheer vertical drop (700 feet at its highest) extends nearly five miles from Hags Head at the southern end to the town of Doolin to the north. At the midway point stands a small castle-like observation tower, built in 1835 by Sir Cornellius O’Brien, a descendent of the 11th century King Brian Boru. It was erected to attract tourists, but given its height (I’m guessing 30 feet tops), it is unlikely to have improved the view in any significant way. Looking at the tower, however (from vantages much further down the pathway) provides a sense of scale, pointing out that all the tiny spots around the tower are in fact people. Just as it does everywhere else in Ireland, folklore abounds in the area. One legend tells of an old sea witch named Mal who fell in love with the mythological hero Cú Chulainn and followed him all over Ireland as he went about his heroic business. To evade her advances, the warrior finally ran from her, hopping the Cliffs of Moher, one to another. Undaunted, the less-nimble Mal pursued him until—you guessed it—she didn’t hop far enough and fell into the ocean. Hence the name ‘Hags Head’, given to the head-like rock jutting from the southern-most cliff. For those who need to escape the sometimes blustery conditions at the top of the cliffs, there is a relatively new vistor’s center built right into a nearby hillside featuring an IMAX-type movie experience, two cafes, restrooms, and gift shop. (I assume the sunny 3-D movie showing cliff views serves as consolation for visitors arriving in soggy weather.) Outside the busy center are crafters and musicians, the latter providing another layer of electricity to the air. 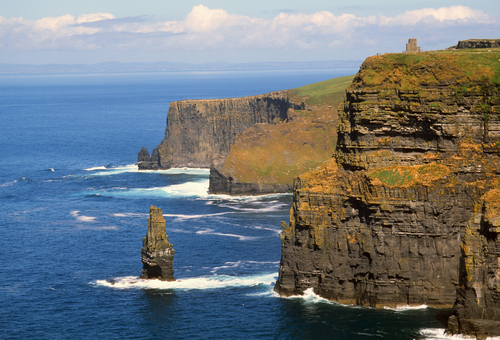 Whether you’re the type to venture close to the precipice or stay safely behind a wall, standing on the Cliffs of Moher, looking out over the endlessly churning Atlantic Ocean is an experience not to be missed. The photographs taken here will be amazing (include O’Brien’s Tower for perspective! ), but nothing will capture the invigoration, excitement, and awe you feel standing so high, so removed, so small, and yet so very happy to be alive.